About 60 high school students attended, as did staff members and parents. 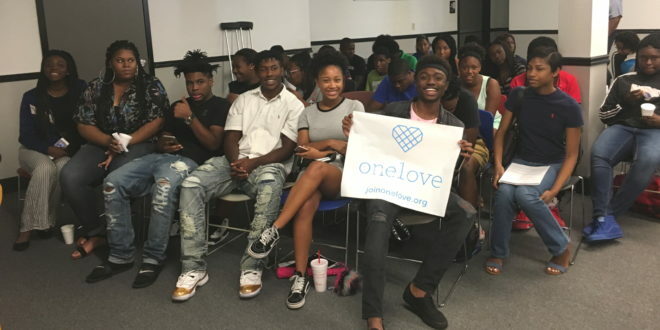 The One Love Foundation and JU students have been implementing the film- and discussion-based program on relationship abuse warning signs for a number of community agencies. 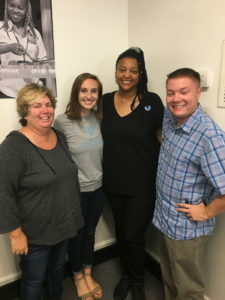 From left, JU Clinical Mental Health Counseling graduate student Cindy Williams; Annie Forrest, Florida Regional Coordinator for the One Love Foundation; Clinical Mental Health Counseling graduate student Africa Pino; and junior biology major Kasey Williams at a recent Escalation Workshop facilitated by the three students. After watching the film “Escalation,” workshop participants discussed the early warning signs of relationship abuse and what they can do if they witness or experience abuse. The conversation was led by the JU student facilitators, who have been trained by Annie Forrest, Florida Regional Coordinator for the One Love Foundation. Jacksonville University has a strong connection to the One Love Foundation and the Escalation Workshop, on several fronts. It was one of six pilot sites for the curriculum nationwide in 2014, after Dr. Kristie Gover, Senior Vice President for Student Affairs, connected with the One Love Foundation through Professor of Communication Dr. Annmarie Kent-Willette, at a Women in Leadership conference at Jacksonville University. Presenting at that conference was Kim Rutkowski, current national Chairman of the Board for the One Love Foundation, who represents yet another link with JU: she is expected to complete her Doctorate of Business Administration in 2018 at the University, and also teaches International Business as a Resource Professor in the Davis College of Business. JU has taken a firm stand against relationship abuse and in educating its students and the community, said Dr. Gover. “It is important for students to recognize the signs of healthy and unhealthy relationships, particularly given social media and the ability to constantly communicate with one another,” she said. Meanwhile, students in the JU School of Applied Health Sciences’ Master of Science in Clinical Mental Health Counseling Program in the Brooks Rehabilitation College of Healthcare Sciences are also trained to facilitate the Escalation Workshop and implement it at their internship sites and in other local agencies. Pino also did an invited professional presentation on the Escalation Workshop for the Northeast Florida Council on Alcoholism and Drug Abuse. Separately, in a partnership with Lutheran Services Florida Health Systems, Dr. Sharon Wilburn, Director of the Clinical Mental Health Counseling Graduate Program, is helping implement a Recovery Peer Specialist training program in Duval and surrounding counties. Recovery peer specialists are also being trained in the Escalation Workshop.